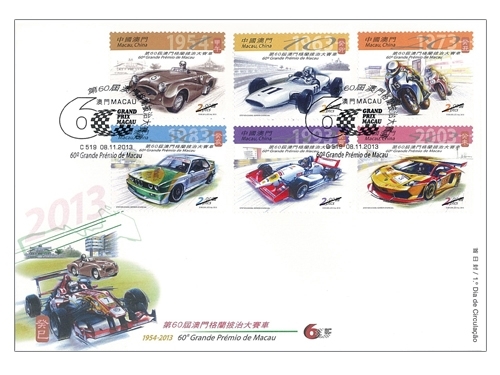 STAMP ISSUE "60th MACAO GRAND PRIX"
The Macau Grand Prix was first held in 1954, this year is running to the Diamond Jubilee. 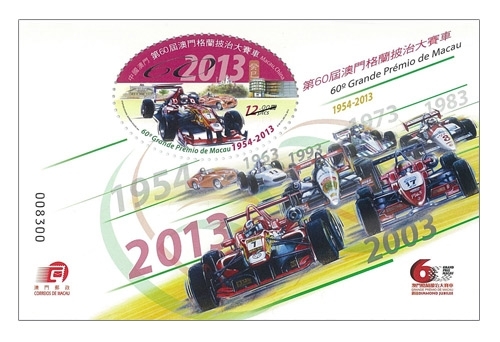 Over the six decades of development and changes, the Macau Grand Prix has grown to become the longest history street circuit and one of the most prestigious motor racing events in the world. With its global reach and great attractiveness, the Macau Grand Prix has become a powerful platform to promote the fascinating diversity of Macao. 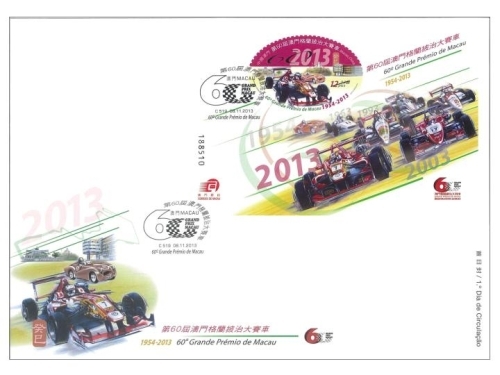 To celebrate this special event, Macao Post will issue the stamp theme "60th Macao Grand Prix" on 8th November, 2013. 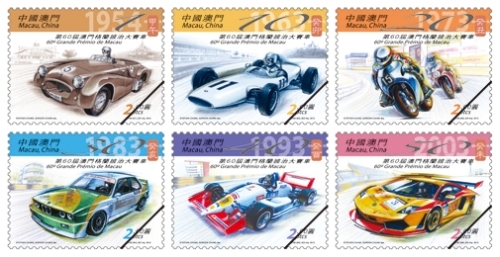 This issue includes a set of six stamps and one souvenir sheet, the six stamps illustrating the racing cars from different eras, combined with the Macao’s historic buildings, and the current and old race control towers, recording the evolution of the Macau Grand Prix. In the souvenir sheet, the digit 60 presenting this anniversary illustrated on the oval stamp is silver foiled for a shiny and luxurious finish, giving the festive spirit. 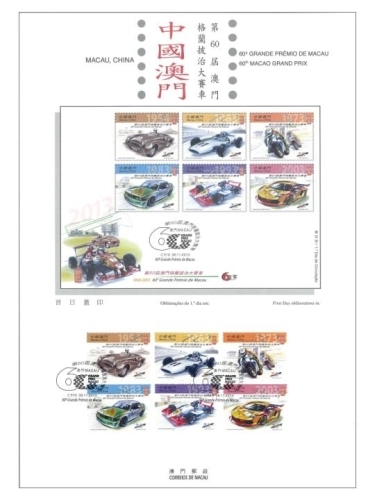 The stamp designers of this issue are Mr. Stephen Chung Kui Sing and Mr. Gordon Chung Wing Kan, and the text of the information brochure is written by the Macau Grand Prix Committee. 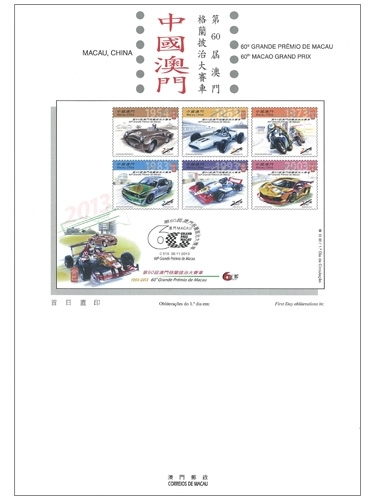 This is the thirteenth issue in 2013. 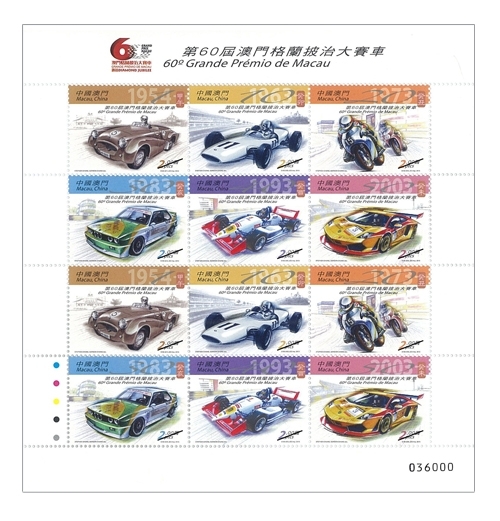 The previous issued stamps are "Lunar Year of the Snake" on 03/01/2013, "Centenary of the Macao Chamber of Commerce" on 23/01/2013, "Mainland Scenery V" on 01/03/2013, "20th Anniversary of the Promulgation of the Basic Law of Macao" on 31/03/2013, "130th Anniversary of the Establishment of the Fire Brigade" on 25/04/2013, the label stamp "Lunar Year of the Snake" on 30/04/2013, "Museums and their Collections III – Macao Museum" on 10/05/2013, "Beliefs and Customs – Na Tcha" on 25/06/2013, "Literature and its Characters – The Romance of the Three Kingdoms II" on 13/09/2013, "Streets of Macao II" on 09/10/2013 and "Christmas" on 21/10/2013. 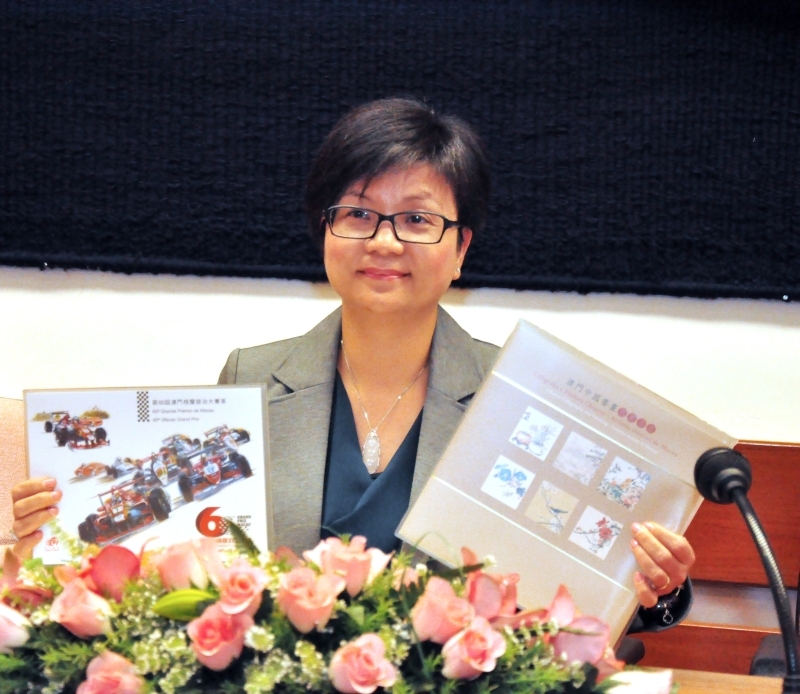 The stamp "Chinese Calligraphy and Painting – Famous Artists in Macao" to be issued on 01/11/2013. 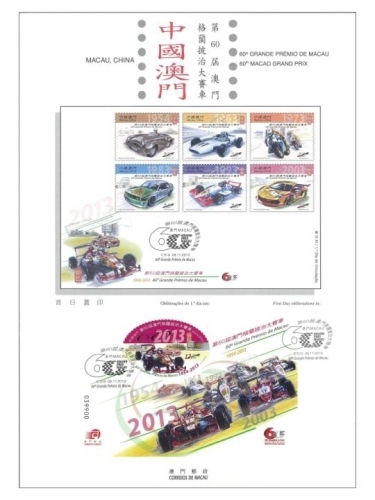 Technical Data of Stamp STAMP ISSUE "60th MACAO GRAND PRIX"